I'll have a pint of maple-bacon, please. Canadians are known for three major culinary constituents: doughnuts, maple syrup, and beer. Several craft producers have succeeded in combining the latter two, while one has even united all three in one glorious beverage. There are several craft brewers that have produced maple beers, incorporating the flavour in both light and dark varieties. Kitsilano Maple Cream Ale is a light beer with a touch of sweetness, but little maple flavour. 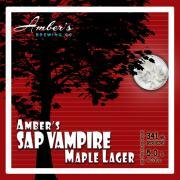 The Sap Vampire from Amber’s Brewing Company has a more pronounced sweetness which some may find overpowering in a lager. Personally, I prefer the maple flavour in darker beers. Brown ales and stouts are brewed with roasted malt varieties such as chocolate, amber, and crystal. These varieties will often impart notes of caramel and toasted bread, which complement the maple flavours added to the brew. British Columbia has two craft breweries that produce dark beers flavoured with maple. The Cannery Brewing Company out of Penticton brews a rich Maple Porter, excellent as an after-dinner drink with dessert (baked apples with walnuts and brown sugar perhaps). Also try the Sap Sucker Maple Porter from Fernie Brewing Company. Brooklyn Brewery brewed a special beer called Mary’s Maple Porter for their Brewmaster’s reserve collection. The porter is named after Mary Wiles, a new employee of the company whose family farm, the Cedarvale Vale Maple Syrup Company, produces maple syrup in upstate New York. Unfortunately, the variety was offered only from February to April 2012. If a maple beer wasn’t avant-garde enough, Rogue has taken it one step further. 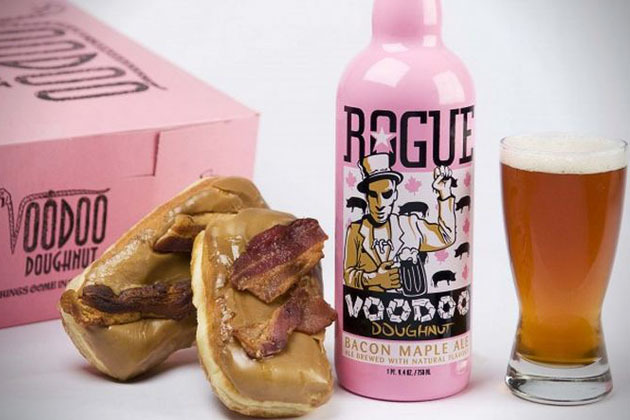 The Oregon-based brewery partnered with the Voodoo Doughnut company to create a beer inspired by their most popular doughnut, the Maple Bacon Bar. The brew incorporates five different malts, three of which are smoked with Hickory, Cherrywood, and Beechwood chips respectively. The brown ale is then flavored with Applewood smoked bacon and natural maple flavouring. The bottle itself is as over-the-top as the beer itself, proudly bearing the Voodoo Doughnut’s signature hue: Pepto Bismol Pink. This beer was popular, to say the least. Twice it was sold out at my favorite beer haunt before I finally obtained a vessel of the glorious liquid. Get some before it’s gone forever! 1) Caramel corn makes a huge mess. Bacon makes it worse. Grease on the stove, caramel on the floor, kernels stuck in your hair...you get the picture. 2) This is possibly the most addictive substance known to man. Be careful who you share it with – the withdrawal symptoms can get ugly. A new addictive substance has been discovered. Pop popcorn with hot air machine, ¼ cup kernels at a time. Crumble bacon over finished popcorn. In a large pot, bring butter, brown sugar, and maple syrup to a boil, stirring constantly. Remove from heat and add maple stout, bourbon, vanilla, salt and baking soda. Stir to combine. Pour caramel mixture over bacon and popcorn mixture and toss to coat evenly. Make sure bacon is evenly distributed. Spread mixture over three baking sheets covered in parchment. Sprinkle each tray generously with sea salt. Bake for 1 hour, stirring the mixture every 15 minutes. Remove from oven. Cool for 1 hour. Note: You can also pop the kernels using the hot oil method, but this is messier and more time-consuming. that was an awesome recipe.. i shared this recipe with my friend in mobile and shared this website.. it was just awesome. i could easily share it instantly with my friend as and when i cooked. Thanks so much! More recipes to come...poutine in a week if all goes well :) Continental Treat has a fantastic beer list too!